Game Day food is usually delicious grub people can eat easily while watching the television. 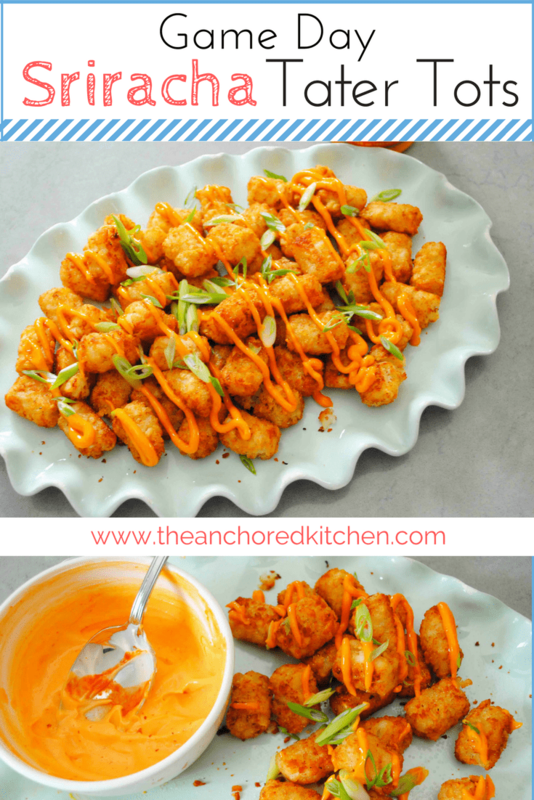 These Game Day Sriracha Tater Tots easily fit the bill. I made these one game day a couple of years ago while we had friends over. I’m a HUGE tater tot fan. Before this game day a friend had sent me a photo of their carnival food and it was spicy tater tots. I knew I wanted to recreate this at home and used this game with friends over to experiment. It was a HUGE success. I ended up making two trays of these delicious little potatoes before running out. They were the first food to be gone and the first food to be requested for again and again. They are so easy that I am slightly embarrassed to even write a recipe for them. I love surprising people with unexpected and fun food. Especially for game days. Whether your sport be football or baseball or hockey, people want fun, easy, and delicious food to scarf down with their beers. Give these a try. I used Sriracha Mayo on top and you can easily find this in most grocery stores now in the Asian area. I like to make my own batch of course. All you need is mayonnaise and sriracha to do it. You can serve it in a bowl alongside the tots for dipping, or you can drizzle it over the top. I have a squeeze bottle on hand, but if you aren’t a freak like me, then just put the sriracha mayo in a ziploc baggie, squeeze it all to one corner, snip the corner off and squeeze it out on top of the tots. 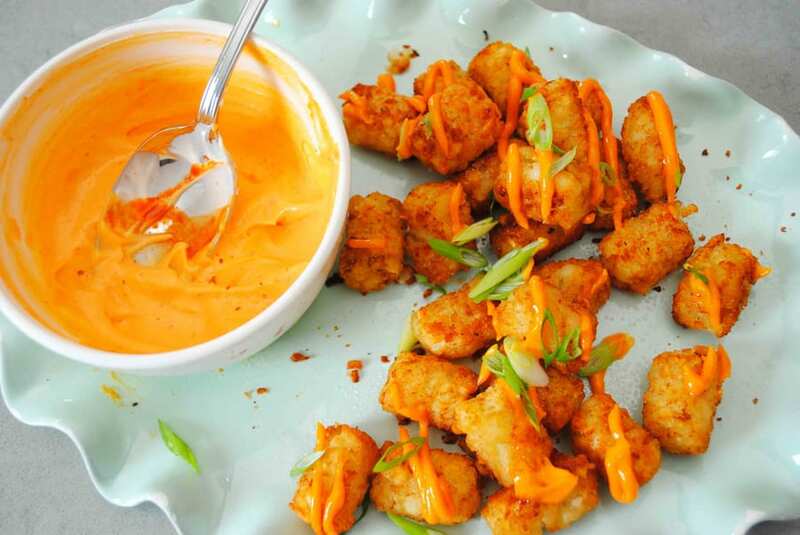 Mix together the mayonnaise and sriracha, if making your own Sriracha Mayo. Other wise use store bought. Heat the tater tots in the oven according the package directions. Once they are done and crispy remove them from the oven and sprinkle with kosher salt to season them. 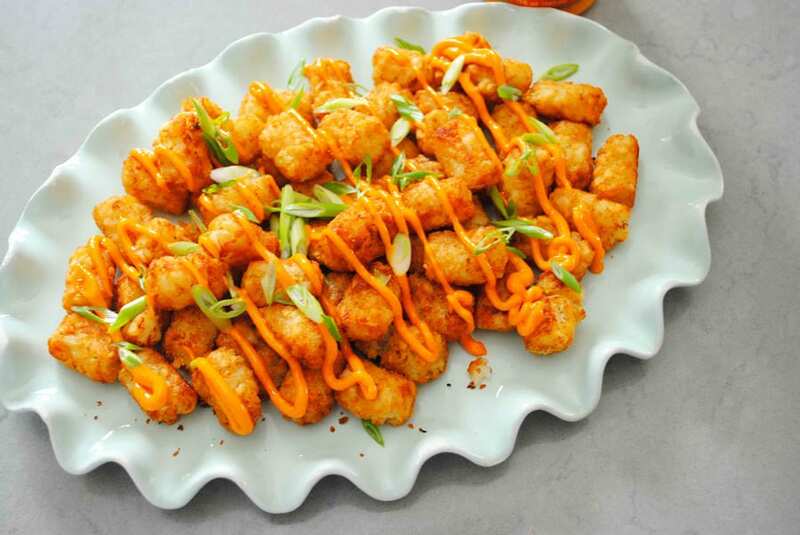 Place the tater tots on a serving platter and drizzle with the sriracha mayo (if using homemade then put the sriracha mayo into a resealable plastic baggie and squeeze it into one corner. Snip the corner off with scissors and then you can squeeze the mayo out onto the tater tots). Sprinkle with the chopped green onions and serve hot.